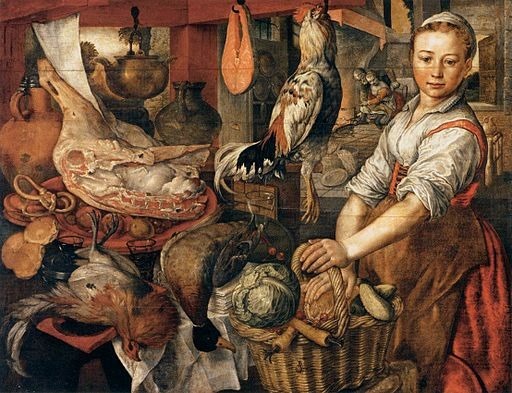 To really understand Shakespeare’s food literature, we need to tuck into food history and even crack open a Renaissance cookbook or two. When Hamlet huffs about the “funeral baked meats” served at his mother’s wedding banquet, he is chastising her for her quick re-marriage, implying that she was serving leftovers from his father’s recent funeral. But funeral baked meats were in fact a real food, and they weren’t as macabre as their name implied — though they were cooked in a “coffin.” The same word was used for “a coffer to keep dead people or to keep meat in,” explains Ken Albala, director of food studies at the University of the Pacific. But these edible coffins, he explains, were made of pastry crust to seal the contents so that they lasted longer. Because that pastry was built to act more like Tupperware than a treat, it was coarse and tossed rather than eaten. 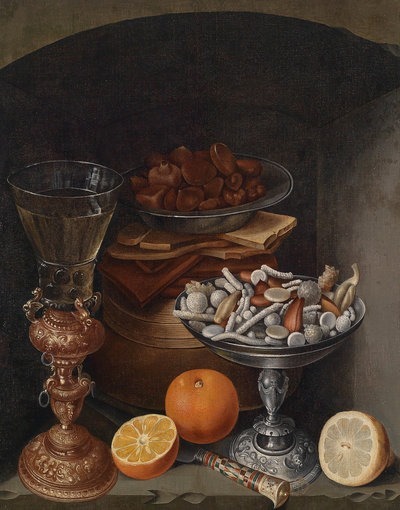 More grim is the drink proffered by Lady Macbeth: To clear the way for murder, she drugs the grooms’ possets — half-food, half-drink staples of Renaissance tables. They were a sort of old-fashioned eggnog made by curdling cream in wine, ale or sack (that’s Spanish Sherry). 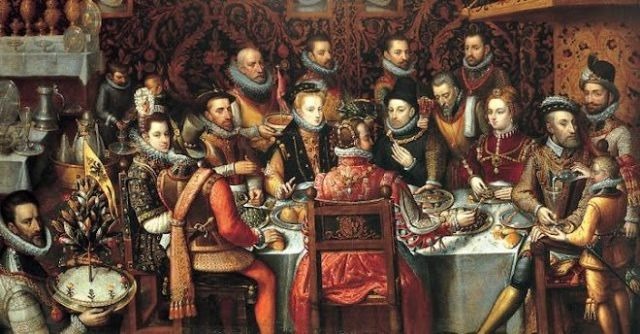 But glossing the Renaissance table helps us understand more about Shakespeare’s plays than simply what his characters ate. For example, then as now, which booze you chose said a lot about who you were. Further down the social ladder, ale came in one size: small (meaning weak in both flavor and alcohol content). Prince Hal remembers “the poor creature, small beer” he drank when he played at being just one of the guys in The Boar’s Head tavern. And in an era when what people ate was largely determined by class standing, we can expect the stage to mirror this reality. 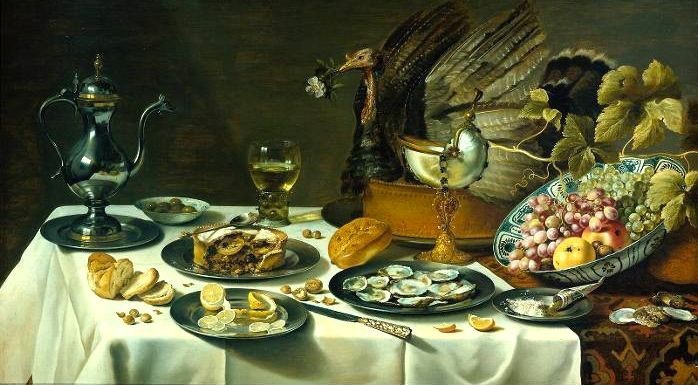 The landed gentry and even well-fed merchants could show off their wealth with a banquet of conserves and comfits – a candy made of a nut or seed coated in sugar. Think of the “kissing comfits” (for sweet breath) Falstaff calls to fall from the sky in The Merry Wives of Windsor. 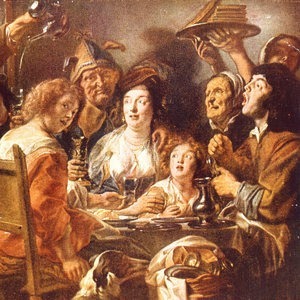 In Shakespeare’s day, a banquet was not a rollicking dinner party in the great hall, but dessert. Or rather, an elaborate final sweet course of expensive sweets and elaborate sculptures crafted in sugar. The truly rich built separate banqueting houses on their manors to host their velvet-clad guests. Fantasy-filled cookbooks of Shakespeare’s day, like Hugh Plat’s Delights for Ladies, let class climbers in on the secrets of the best tables in England with recipes for comfits. The detailed and diverse 11 pages of directions recommend that “for every two pound of sugar, a quarter of a pound of aniseeds or coriander seed” be used. Ivan Day, a British food historian known for his detailed recreations of meals of bygone eras, shows how it’s done. But the painstaking preparation of coating spices with layers and layers of sugar means they were usually left to the professional comfit maker. And then there are those foods that cover a whole host of dishes and yet nothing in particular: kickshaws and cates. In The Taming of the Shrew, Petruchio insists on shortening Katherine’s name, despite her resistance to the diminutive. In their running battle of wits, his pun on “household cates” turns Kate into a dainty dish ready to be devoured. “Cates” could be just about any food, but the term was usually reserved for the choicest morsels in the larder. Same with kickshaws, like those that Shallow orders up in Henry IV, Part II: “a couple of short-legged hens, a joint of mutton, and any pretty little tiny kickshaws.” It’s an adulteration of the French quelquechose and a commodious cornucopia of a word covering a host of savory appetizers. For homemade kickshaws, Gervase Markham’s The English Housewife (printed one year before Shakespeare’s death in 1616) instructs the cook to mix eggs, cream, currants, cinnamon, cloves, spinach, endive, marigold flowers and pigs’ pettitoes [feet]. 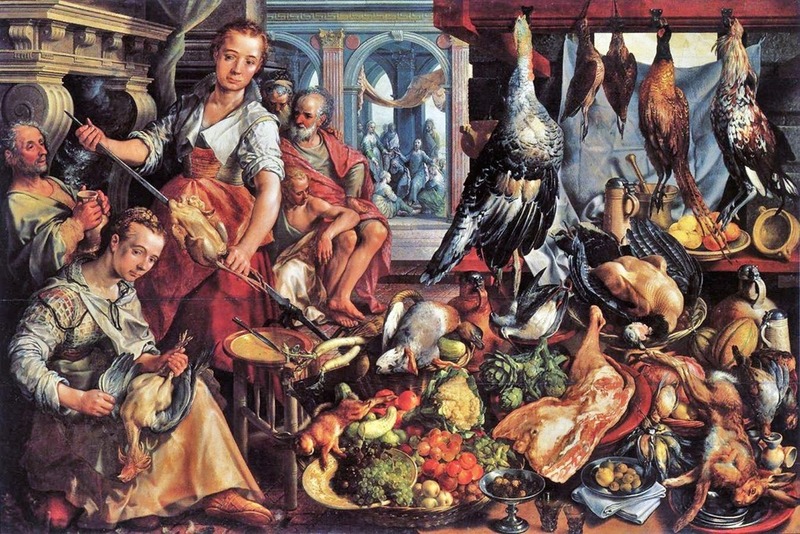 But he also suggests using small birds, roots, oysters, giblets, lemons. And plenty more. “Who can do these need no further instruction for the rest,” he insists. Markham’s directions, like all cookery books of the period, read more like shopping lists and stream-of-conscious kitchen stories than today’s cookbooks, with their meticulous measurements and over-explaining. As for the jumbles and umbles that may make us mumble through Shakespeare’s plays, it’s hard not to quip that a dish by any other name would taste as delicious.